Pablo Casals championed David Popper's music. My recent post about Popper attracted a lot of readers. 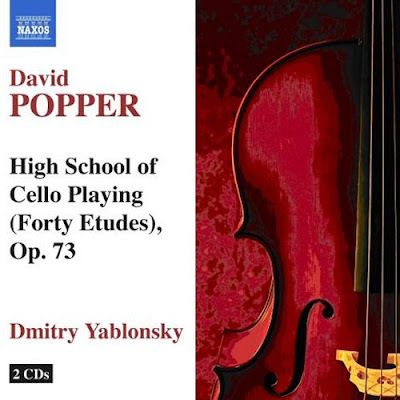 Naxos has just released this double CD of the forty Études that make up Popper's Hohe Schule des Violoncello-Spiels (High School of Cello Playing). High school cello -> old school cello -> new school cello. "De'ak recounts that Popper once told him he got the idea for no. 36 from his many train trips during his touring days. The rapidly ascending and descending scales are a depiction of the train rolling along the track"